The 2018 "Fresh Catching Contest" was held at the 3F International Conference Center of the National Taiwan University Hospital. 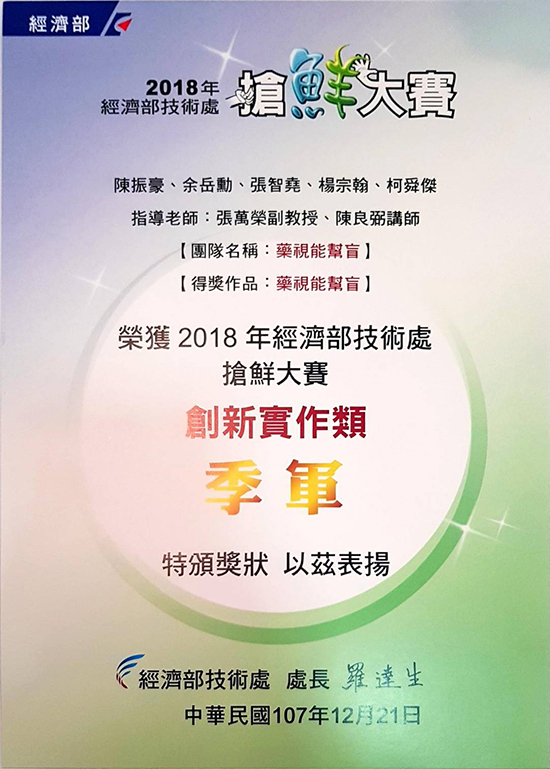 The Internet of Things Laboratory of the Electronic Engineering Department of the National Taiwan University of Science and Technology won the third prize in the 2018 Pre-emptive Competition and won the Best Popularity Award. Two awards, adding new achievements. The 2018 "Pre-emptive Contest" continues the "Creation and Creation" category, "Innovative Practice" and the "Entrepreneurship Concept" category for cultivating innovative and entrepreneurial energy. It is provided by the Industrial Research Institute, the Information Technology Association and the Chinese Academy of Sciences. 38 technical achievements, invite students to participate in the election, and hold GF Workshop, allowing the selection team to strengthen oral expression, establish teamwork and stimulate entrepreneurship through expert guidance. This year, the participating teams came from 46 colleges and universities to participate in the competition. The total number of candidates was 264. After the review, a total of 35 works stood out and entered the finals. Southern Taiwan University of Science and Technology stood out in this competition. 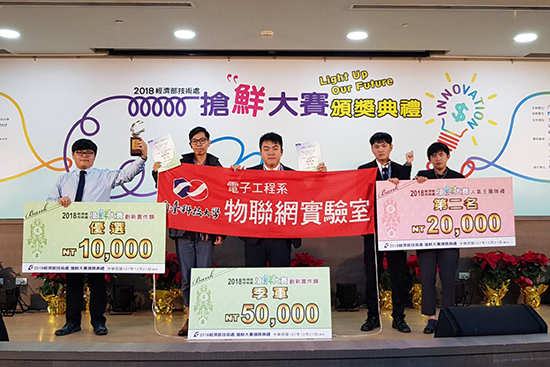 The “Pharmaceutical Assisting” team composed of Chen Zhenhao, Yu Yuexun, Zhang Zhixuan, Yang Zonghan and Ke Yujie, led by Associate Professor Zhang Wanrong of the Department of Electronics, won the third prize of “Innovative Practice” in the competition. The "medical vision help" system architecture is divided into smart glasses, drug identification devices, and visual cloud management platform for visually impaired patients. When visually impaired people wear smart glasses, the photo opportunities on the glasses capture the drug pictures and then use USB. The drug image is sent to the drug identification device to identify the type and quantity of the drug, and then the voice is notified whether the medication is correct. The system uses AI deep learning technology to identify drugs, and its successful recognition rate has reached more than 97%, which can effectively solve the problem of multiple wrong drugs in multiple chronic visually impaired patients. 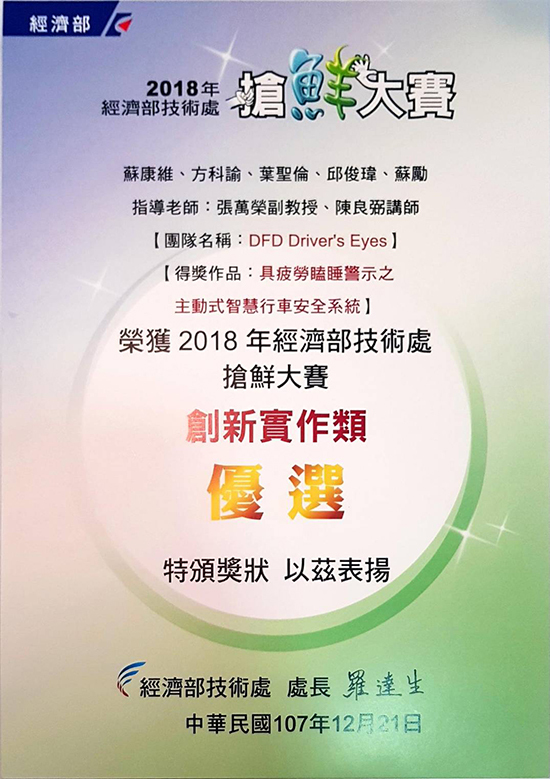 In addition, another team of award-winning teams, the "DFD Driver's Eyes" team led by Associate Professor Zhang Wanrong from the Department of Electronics, won the "Innovation Practice" award and won the second place in the competition's Best Popularity Award. The team is developed by Su Kangwei, Fang Kezhen, Ye Shenglun, Qiu Junyi, and Su Li. The "Active Smart Driving Safety System with Fatigue Sleep Warning" is a group of sleepiness detection devices based on wearable smart glasses. . Wearable smart glasses use the infrared reflection amount of the 850nm infrared ray receiver with their own method to judge the eye opening situation and observe the frequency of driving the blinking eye, which is used as the judgment basis for fatigue and sleepiness. Through the system, the driver's fatigue and sleepiness can be detected immediately, and the driver is immediately alerted to wake up the driver. At the same time, the driver information is uploaded to the cloud management platform through low-cost, low-power and high-quality SigFox transmission. Lu Dengmao, president of Southern Taiwan University of Science and Technology, said that Southern Taiwan University of Science and Technology attaches great importance to students' creative creativity and entrepreneurial ability. The general teaching theory only covers architecture and concepts. The education of Southern Taiwan University of Science and Technology is to induce students how to effectively apply this concept to solve problems. The problem, in turn, encourages students to innovate and start their own businesses to realize the benefits of applying what they have learned, and hopes to implement the vision of students “graduating with their own companies”. Southern Taiwan University of Science and Technology provides students with special production funds and entrepreneurial counseling resources. In addition to improving research and development, it also integrates with industry resources and promotes the general center counselor through innovation and entrepreneurship.